The Memorial Candle Program has been designed to help offset the costs associated with the hosting this Tribute Website in perpetuity. Through the lighting of a memorial candle, your thoughtful gesture will be recorded in the Book of Memories and the proceeds will go directly towards helping ensure that the family and friends of Allan Bonner can continue to memorialize, re-visit, interact with each other and enhance this tribute for future generations. Passed away on Sunday, February 15, 2015 in his 87th year. Beloved husband of the late Pauline. 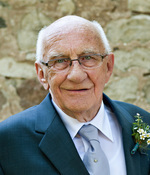 Loving father of Pennie and Stacey (Derek). A cherished grandfather and great-grandfather . Predeceased by his parents Peter and Marjory Bonner. A devoted friend to many and will be missed by his fellow Amateur Radio Operators. Friends will be received at the Ward Funeral Home, 2035 Weston Road (north of Lawrence Ave) Weston, on Friday from 2-4/7-9 pm. A service will be held in the chapel on Saturday, February 21st at 11 am. Interment Prospect Cemetery. In lieu of flowers donations to the Alzheimers Society would be greatly appreciated.